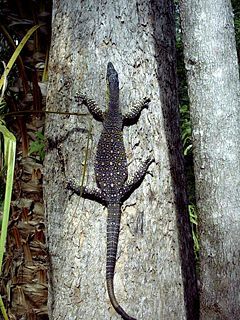 (Varanus varius) on a tree. Monitor lizard, or monitor, is the common name for any of the Old World lizards comprising the Varanidae family, which contains only one extant genus, Varanus, whose members are characterized by a generally elongate neck, a heavy body, long-forked tongues, and long, non-autonomous tails. While some monitor lizards are small, the genus also contains some very large extant lizards, including the largest living lizard, the Komodo dragon, which reaches three meters in length and 54 kilograms in weight and can even feed on large mammals, like deer, pigs, and buffalo (Ast 2003). One fossil species from about 20,000 years ago reached seven meters in length and 600 kilograms. Monitor lizards today are found in a vast area in the Old World, including Africa, Asia, Oceania, and Australia. The name, "monitor," is also used for a species in different, but closely related, family, the earless monitor (Lanthanotus borneensis) in Lanthanotidae, a semi-aquatic, brown lizard from Borneo. This article will be restricted to discussion of the varanids (Varanidae). Monitor lizards are important to food chains in their various terrestrial and aquatic (including marine) habitats, both as predator and prey. They consume a wide variety of invertebrates and vertebrates, including carrion and even fruit in the case of some varanids. For humans, monitor lizards are important in various cultures for art, folklore, and a source of food, leather, and folk medicine. Thus, as with other taxa, varanids not only advance a function for the individual (survival, reproduction, self-maintenance of the species), but also provide a function for the whole (ecosystem, humans). The Varanidae family is part of the infraorder Anguimorpha, which also includes alligator lizards, galliwasps, legless lizards, knobby lizards, and the extinct mosasaurs, as well as the gila monster and Mexican bearded lizard. The Varanidae family contains only one extant genus, Varanus. 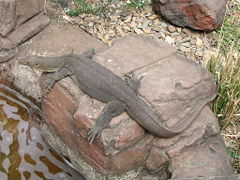 There are extinct varanids that have been placed in other genera, such as Telmasaurus and Megalania (although some have reclassifed the latter as part of Varanus). There are about fifty to sixty modern species of Varanus. Monitor lizards tend to be robust, diurnal lizards, with elongate necks and non-autotomous tails (Ast 2003). They have long, forked tongues, which are used for chemorecption, and their hemipenes are unusually ornate, with paired apical horns (Ast 2003). Extant monitors range in size form the short-tailed monitors, which reach 20 centimeters in length and 20 grams in weight, to the Komodo dragon at three meters in length and 54 kilograms (119 pounds) (Ast 2003). These extant species cover a vast area, being found in Africa, the Asian subcontinent from India and Sri Lanka to China, down Southeast Asia to Indonesia, the Philippines, New Guinea, and Australia and the islands of the Indian Ocean and South China Sea. About one half of the species are found in Australia (Ast 2003). They occupy a wide range of habitats, including terrestrial and aquatic (including marine), including such terrestrial habitats as burrowing, surface, living among rocks, or arboreal (Ast 2003). Those primarily aquatic must still lay their eggs on land as with all reptiles. Monitor lizards typically are diurnal and almost all monitor lizards are carnivorous; however, they have diverse feeding behaviors, with not all species fully carnivorous predators. Diets of various species of monitor lizards include fruit, invertebrates, mammals, birds, fish, and carrion. 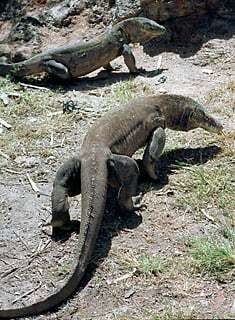 The Gray's monitor (Varanus olivaceus) eats mollusks, but also eats fruit and displays foraging type behavior (Ast 2003). The Komodo dragon (Varanus komodoensis) will eat large mammals, such as deer and buffalo, utilizing a sit-and-wait or stealthy approach until the prey can be ambushed (Ast 2003). Komodo dragons also eat invertebrates, birds, and small mammals, but their main food source is carrion, which other large monitor lizards are known to eat as well (Mattison 1992). Komodo dragons can locate a dead or dying animal from a range of up to 9.5 kilometers (6 miles) (Darling and Darling-Lyon 1997). Komodo dragons also have been observed knocking down large pigs and deer with their strong tail (Attenborough 2008). Monitor lizards are also known to capture and eat small monkeys, fish, squirrels, and crabs. Varanid lizards are considered to be intelligent, with some species showing a capacity to even count (King and Green 1999). Studies at the San Diego Zoo involving feeding of the white-throated monitor (Varanus albigularis) various numbers of snails showed that they can distinguish numbers up to six (King and Green 1999; Pianka 2004). Nile monitors (Varanus niloticus) have been observed to cooperate when foraging (King and Green 1999). One varanid lures the female crocodile away from her nest while the other opens the nest to feed on the eggs (King and Green 1999). The decoy then returns to also feed on the eggs (King and Green 1999; Pianka 2004). Komodo dragons at the Smithsonian National Zoological Park in Washington, D.C., recognize their keepers and seem to have distinct personalities (Pianka 2004). Monitor lizards produce by sexual reproduction; however, some monitor lizards are apparently capable of parthenogenesis (Smith 2006). Varanids are represented widely in the [[fossil record], with pre-Miocene fossils found mostly in Asia and North America, and in Europe, Africa, and Australia by the middle Miocene (Ast 2003). A fossil given the genus name Telmasaurus traces to Cretaceous deposits of North America and Mongolia. A fossil species, Varanus marathonensis, may have been in Europe up to the Pliocene. An extinct giant monitor lizard from Quaternary deposits in Australia, which died out roughly 20,000 years ago, reached an enormous length of seven meters and a weight of 600 kilograms (Ast 2003). It had two centimeter, curved serrated teeth (Ast 2003). This lizard was originally placed in the varanid genus Megalania as M. prisca, although some place it in Varanus as V. priscus. The discovery of venom in monitor lizards, as well as in agamid lizards, has led to the Toxicofera hypothesis: That all venomous reptiles share a common venomous ancestor. The genus name, "Varanus" is derived from the Arabic word waral ورل, which is translated to English as "monitor." It has been suggested that the occasional habit of varanids to stand on their two hind legs and to appear to "monitor" their surroundings led to the original Arabic name (Pianka et al. 2004). According to legend, these lizards were supposed to warn people that crocodiles were nearby (Pianka 2004). In Tamil and Malayalam, monitor lizards are known as "udumbu" and in Australia, they are known as goannas. In Kannada, monitor lizards are known as "uda." In Sinhalese the monitor lizard is known as "kabaragoya." In addition to their role in food chains, serving as predators and prey (very large monitors, like the adult Komodo dragon, are apex predators), monitor lizards also are important to humans. In some cultures, they are represented in art, folklore, and superstitions (Ast 2003). In Africa, Asia, and Australia, monitors are eaten (Ast 2003). Some are commercially important for their skins, which are made into leather, and body parts may be used for folk medicine (Ast 2003). 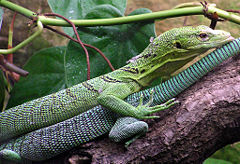 Monitors also have become a staple in the reptile pet trade. The most commonly kept monitors are the savannah monitor, white throated monitor, and Acklin's monitor, due to their relatively small size and ease of domestication. Nile monitors, water monitors, mangrove monitors, and papau monitors have also been kept in captivity. Like all reptiles that are kept as pets, monitors need hiding places, and an appropriate substrate (bedding). Monitors also need a large water dish in which they can soak their entire body. In the wild, monitors will eat anything they can overpower, but crickets, superworms, and the occasional rodent make up most of the captive monitors' diet. Boiled eggs, silkworms, earthworms, and feeder fish can also be fed to monitors. Monitor lizards have been compared to "reptilian cats"—independent animals with different personalities. However, due to their predatory nature and large size, some monitors can be dangerous to keep as pets. Adult Nile monitors can reach seven feet in length, and are stronger than an alligator of equal weight. The Bengal monitor lizard, also known as the common Indian monitor lizard, is found in Asia and Africa. It is widely said to have been used to scale the fort of Kondana in Pune, India, by Tanaji Malusare, a general in the army of the Maratha ruler Shivaji. The skin of this lizard has traditionally been utilized in making the Kanjira, a South Indian classical percussion instrument. Now however, it is not in vogue owing to the increased awareness to the dwindling population of the lizard. The lizard evokes mixed responses from the people across the world. It is considered a delicacy in Sri Lanka. It is killed for sport in North Eastern India. It is revered in Maharashtra, India where an entire clan of people use "Ghorpade" as their surname after "Ghorpad," the local name for the Bengal monitor lizard (Bennett 1995). A monitor lizard seen at the Australia Zoo. Asian water monitor (Varanus salvator salvator). Ast, J.C. 2003. Varanidae. Animal Diversity Web. Retrieved June 5, 2008. Attenborough, D. 2008. Life in Cold Blood. Princeton, NJ: Princeton University Press. ISBN 0691137188. Bennett, D. 1995. A Little Book of Monitor Lizards: A Guide to the Monitor Lizards of the World and Their Care in Captivity. Aberdeen: Viper Press. ISBN 095266321X. Darling, K., and T. Darling-Lyon. 1997. Komodo Dragon. New York: Lothrop, Lee & Shepard Books. ISBN 0688137776. Fry, B. G., N. Vidal, J. A. Norman, F. J. Vonk, H. Scheib, S. F. R. Ramjan, S. Kuruppu, K. Fung, B. Hedges, M. K. Richardson, W. C. Hodgson, V. Ignjatovic, R. Summerhays, and E. Kochva. 2006. Early evolution of the venom system in lizards and snakes. Nature 439: 584-588. Retrieved June 5, 2008. King, D., and B . Green. 1999. Goannas: The Biology of Varanid Lizards. University of New South Wales Press. ISBN 086840456X. Integrated Taxonomic Information System (ITIS). 2006a. Varanidae. ITIS Taxonomic Serial No. : 174114. Retrieved June 5, 2008. Integrated Taxonomic Information System (ITIS). 2006b. Varanus Merrem, 1820. ITIS Taxonomic Serial No. : 174115. Retrieved June 5, 2008. Mattison, C. 1992. Lizards of the World. New York: Facts on File. ISBN 0816057168. Pianka, E. R. 2004. Varanidae. Pages 359-368 in B. Grzimek, S. F. Craig, D. A. Thoney, N. Schlager, and M. Hutchins. Grzimek's Animal Life Encyclopedia, 2nd edition. Detroit, MI: Thomson/Gale. ISBN 0787657786. Pianka, E. R., D. King, and R. Allen King. 2004. Varanoid Lizards of the World. Bloomington: Indiana University Press. ISBN 0253343666. Smith, K. 2006. Dragon virgin births startle zoo keepers. Non-sexual reproduction could lower the fitness of captive animals. Nature News December 20, 2006. Retrieved June 5, 2008. This page was last modified on 6 June 2008, at 13:35.